It had been billed as a match between Paul Nicholls’ two stable stars, but after Kauto Star fell four out and Denman finished only second, a new Cheltenham hero was welcomed in after today’s totesport Gold Cup. Imperial Commander, trained by Nigel Twiston-Davies a dozen miles from the racecourse at Naunton, always travelled smoothly under Paddy Brennan to take the race by seven lengths. “I loved all the Kauto Star/Denman thing, I always thought we could beat them. Everybody was talking them up and and wearing their green scarves, nobody looked at us with our black and white scarves and reading the press you’d think he didn’t get three miles,” said Twiston-Davies. “Paul Nicholls has done a wonderful job with his two horses but we need new horses coming through and ours is the best now. “Kauto Star was in trouble a long way out, he wasn’t the horse he normally is. 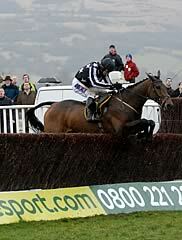 Denman didn’t run well the time before and as soon as Kauto Star was beat I thought it was ours. “I’ve been lucky enough to win two Grand Nationals and now this, so my CV is nearly full now, it’s just a shame Khyber Kim came up against Binocular in the Champion Hurdle. Carl Llewlleyn, assistant to Twiston-Davies, said: “The way the papers spoke this morning, it was a two-horse race and every other horse was ignored which I thought was strange. “The only two we have really fancied this week have been this fellow and Khyber Kim. Nigel doesn’t have the rich owners who can buy readymade horses so it was a great effort. Jockey Paddy Brennan described this as the best day of his life after winning the totesport Cheltenham Gold Cup aboard Imperial Commander. “It’s every jockey’s dream to win a Gold Cup and you know it might never happen again,” said Brennan. “The good thing was that he didn’t have a gruelling race and he pulled up a fresh horse. He settled in the race and made it easy for me. “He’s a superb horse trained by a brilliant man and with a great owner. I just turn up in my suit at the races to ride him, it’s the team at home who do all the work. A lot of hard work has gone into this. “This is the best day of my life. There are lots of dark moments in racing but today I will remember for the rest of my life, it’s the best feeling I’ve ever had. To be up there with some of the great jockeys who have won the Gold Cup is a great feeling. Imperial Commander is syndicated into eight shares split between six owners (two have two shares each), headed by Carlisle-based Ian Robinson. “We prepared our horse for the day. He was a ball of muscle and we knew that was as good as he could be,” said Robinson. “It was an amazing training performance, Nigel and his team do not get the recognition they deserve, and this was our dream. According to Nigel Twiston-Davies, Imperial Commander was bought for £30,000 by the Our Friends In The North syndicate through bloodstock agent Kevin Ross after winning a point-to-point at Summerhill in County Meath in April, 2005.